This article shows how Project Neptune developed through meetings and research, with the young people and contributing artists, and will be illustrated with sketches and photographs. 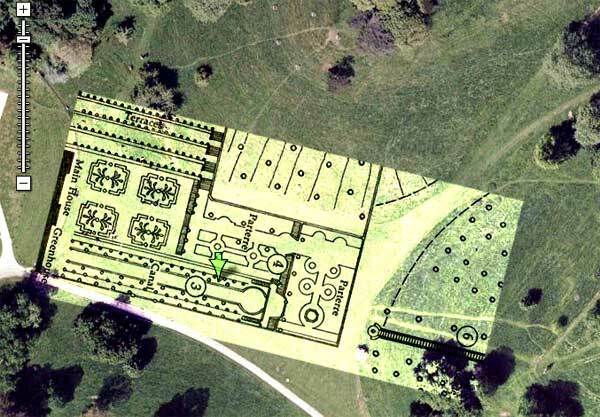 Lead Artist Nathan Hughes overlays original plans of Dyrham Park’s lost East Gardens onto a Google Map image. In the picture below, the house is beyond the left edge, Neptune’s statue is bottom left at the head of the cascade, and the event vantage point is the cluster of trees just right of centre on the top edge. Dark Spark took these ideas and images and delivered one of the biggest fire drawings ever undertaken in the UK (0.8 of a kilometre of fire rope was used). 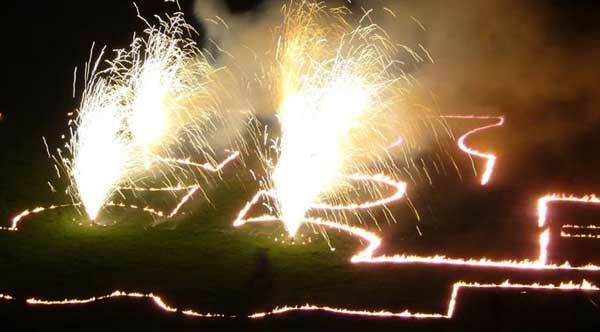 Fire drawings are usually hung from cranes so that audiences can view them. Dark Spark relished the unusual opportunity to devise a pyrotechnic show based around a fire drawing which would be seen from an elevated position.